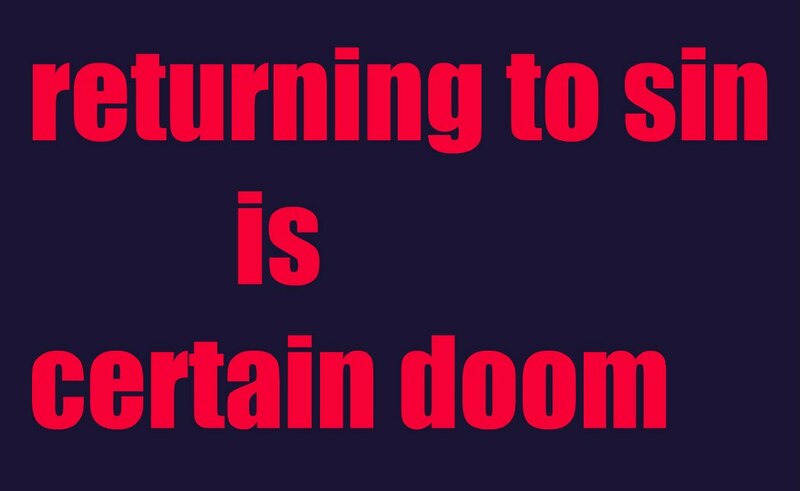 Returning to sin is certain doom – I Am Not Ashamed Of The Gospel Of Christ! For many christians the thought of returning to the life of sin they repented of is not even an option,but for those who jest at sin as though there is no recompense may consider the following passage of what Jesus said to a man He healed (John 5:8-14). 8 Jesus saith unto him, Rise, take up thy bed, and walk.9 And immediately the man was made whole, and took up his bed, and walked: and on the same day was the sabbath.10 The Jews therefore said unto him that was cured, It is the sabbath day: it is not lawful for thee to carry thy bed.11 He answered them, He that made me whole, the same said unto me, Take up thy bed, and walk.12 Then asked they him, What man is that which said unto thee, Take up thy bed, and walk?13 And he that was healed wist not who it was: for Jesus had conveyed himself away, a multitude being in that place.14 Afterward Jesus findeth him in the temple, and said unto him, Behold, thou art made whole: sin no more, lest a worse thing come unto thee. The previous passage teaches us that to return to sin after being forgiven and healed is not a good idea,and even a worse thing may come upon us!To escape the worlds sin through finding the knowledge of Christ and to go back is as the proverb “The dog is turned to his own vomit :and the sow that was washed to her wallowing in the mire (2 Peter 2:20-22). 20 For if after they have escaped the pollutions of the world through the knowledge of the Lord and Saviour Jesus Christ, they are again entangled therein, and overcome, the latter end is worse with them than the beginning.21 For it had been better for them not to have known the way of righteousness, than, after they have known it, to turn from the holy commandment delivered unto them.22 But it is happened unto them according to the true proverb, The dog is turned to his own vomit again; and the sow that was washed to her wallowing in the mire. Hebrews 6:1-6). Therefore leaving the principles of the doctrine of Christ, let us go on unto perfection; not laying again the foundation of repentance from dead works, and of faith toward God,2 Of the doctrine of baptisms, and of laying on of hands, and of resurrection of the dead, and of eternal judgment.3 And this will we do, if God permit.4 For it is impossible for those who were once enlightened, and have tasted of the heavenly gift, and were made partakers of the Holy Ghost,5 And have tasted the good word of God, and the powers of the world to come,6 If they shall fall away, to renew them again unto repentance; seeing they crucify to themselves the Son of God afresh, and put him to an open shame. An excellent and frightening reminder to avoid the “Cheap grace and easy believism” teaching of the modern religious systems. The Hebrews quote is one of the most frightening verses in Scripture. This is NO time to play religious games. The time for lukewarm church playing is over. It is time for serious discipleship and obedience to HIM+ Who washed us from our sins in HIS+ Own Blood.